REPL Group's offices in Henley-In-Arden. Photo supplied. 60 new jobs look set to be created in Warwick after a £1million investment. Midlands based Retail IT consulting and technology firm REPL Group has announced the opening of a new office in Broxell Close, Warwick. The £1 million pound investment will create 60 new jobs. The Warwick-based tech hub will act as a testing lab for the firm as it increases its R&D testing and data science capabilities. This will be the latest in a string of new locations opened by Henley-In-Arden based group, coming after new openings in the US, Japan and most recently South Africa. 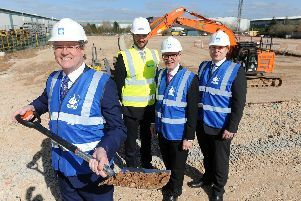 The new hub, which will house the Group’s test centre, will be headed up by Neil McGregor, operations director, and Antony Kaplan, test director. Mike Callender, executive chairman, REPL Group, said: “The past six months have been a period of change for REPL. The opening of our new offices is not only creating new opportunities for us as a business, but we are also providing new employment opportunities to the people in those areas. “Our people are a vital part of REPL and it is great to see that they are being recognised for their contributions to the industry, with our CEO Cerys Johnson having also been announced as a finalist for the West Midlands Woman in Tech Award.